This is the only romantic movie which I didn´t find totally boring, and I´m pretty cynical person. It has good mix of tragedy, love story, some humour and amazing visual effects. this is the BEST movie ever made to date! a good movie, but don't see it in 3-d. 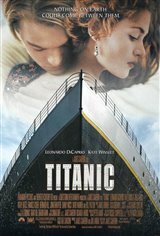 I have never been so entranced by a movie as I was by Titanic. An absolute must-see. Pure perfection. A cinematic masterpiece. I could go on and on about how amazing this movie is!